Some experts recommend 10,000 steps per day to be healthy–is that actually true? Have you ever wondered what the recommended steps per day are for an average adult? Let’s put this into perspective. The average American employed spends about 7.6 hours at work daily, and the average adult spends approximately 2.8 hours in front of a TV each day. What does that total up to, but a whopping 10+ hours sitting every day? Considering these statistics, the real question might be: How can I integrate more activity into my (most likely) sedentary existence? That’s a matter worth thinking about. The “traditional” wisdom says that 10,000 recommended steps per day will improve your health. But the origins of this figure aren’t exactly scientific. When pedometers were sold in Japan in the 1960s, they were called “manpo-kei,” meaning “10,000 steps meter.” The idea gained popularity with walking groups, and apparently this number has been thought the standard ever since. Most experts will agree that increasing your steps beyond what you’re used to doing will help your health in any case…but of course, how your life is configured will certainly play into how much you gain. 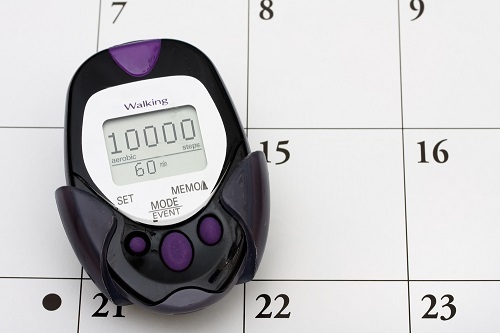 In one study, women who increased their steps to 10,000 a day reduced their blood pressure after 24 weeks! That’s a sign of a long-term positive effect, besides the obvious benefits of increased energy and sense of well-being. It’s also been shown by another women’s study that walking 10,000 a day decreased their glucose levels! According to the recommendation by the Centers for Disease Control and Prevention, adults should engage in 150 minutes of brisk activity each week to maintain health. That could be 7,000 to 8,000 steps each day, roughly the equivalent of adding a 30-minute walk to your routine if you usually walk about 5,000 steps. But if you can do more, so much the better! Integrating your new step goals into your daily activities can be a challenge. That’s why many companies are investing in corporate wellness pedometer programs and other wellness initiatives in order to support employees in creating these habits. It’s important to think about when you can do it in your routine, and ensure that you can do so consistently. Having a pedometer can make this a fun and even exciting venture—who ever knew how many steps you can take in a single day!? Wellworks For You is a corporate wellness company supporting people and corporations in their goals for recommended steps per day. We believe that everyone can reach their wellness goals and strive to establish the best systems to support this. If you are interested in learning more about our programs, please contact us at 610.228.4331.